Retire to Colorado, listed as the number one ideal place to retire. well as the most populous city of Colorado. When people think of Colorado, they normally think of outdoor fun in the Rocky Mountains. Think again, nearly half of Colorado are farms andranches. It is also home to over 64 licensed wineries; you can plan short day trips to visit wineries in almost every part of the state and find a wine trail to follow and enjoy the day. Known as the Front Range, there are two cities which have attracted more retirees than others: Boulder and Ft. Collins. Boulder, the home of the University of Colorado is surrounded by foothills, parks and trails as well as a healthy environment that lends itself to an almost spiritual balance. 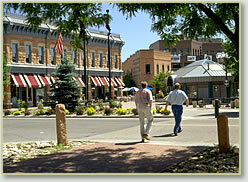 Along with Pearl Street Mall and the Colorado Music Festival, this is one town you are sure to love. Ft. Collins, one of the largest cities in Colorado, had renowned residents such as James Michener, and Allen Ginsberg, the famous poet. With a population of approximately 99,000 people, you will find Ft. Collins a mecca for fine dining and entertainment, as well as the site of Colorado State University. Whichever city you choose to retire to Colorado, you will find friendly people; wonderfully vibrant towns, and a host of activities and cultural events which will keep you in tune, along with its natural environment and scenery which will leave you at a loss for words if you retire to Colorado. Retire to Denver and see why baby boomers are considering this city as the best to retire, it has become tops on their list. The “Mile High City” has a diverse culture, arts and entertainment, shopping, affordable housing, fabulous year-round weather, and a landscape that is unsurpassed by any stretch of the imagination. Located in the foothills of the Rocky Mountains, Boulder is just 35 miles northwest of Denver. The ideal place to retire for outdoors types; with mile after mile of hiking and biking trails, along with numerous rivers just made for fishing. Boulder is an outdoorsmen’s paradise, there is something for everyone and offers a variety of interesting and entertaining attractions year-round. Retire to Ft. Collins is considered one of the best places to retire, Ft. Collins is situated at the foothills of the Rocky Mountains. Along with recreational activities and diverse cultural attractions, you would be hard-pressed to find another more engaging city than Ft. Collins, Colorado. To all baby boomers - this is the best place to retire! Loveland, considered a smaller town 45 minutes from Denver, is a quiet area known for its artists, professors, students, artists, restaurants and new art galleries, all nestled in stately turn-of-the-century buildings. In addition, there is also a community of sculptors which has placed Loveland as among the best art towns in the United States.